There is also a conversation there with a Jewish reader…. 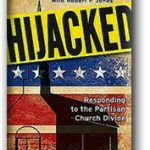 In Hijacked Mike Slaughter and Charles Gutenson make a fairly detailed case for arguing that the ground has shifted in the church and that political, not theological language now dominates the way that Christians talk about their faith. I am also deeply troubled by the fact that Christian leaders seem to be unable to talk in substantive theological categories about the challenges that they face. How long do clergy and lay leaders think we can go down this road before the distinctive nature of God’s voice is lost among short-lived, brutish, audience-tested language developed by spin-doctors for what passes as stateswomen and statesmen? And then there is the ugly, unconscionable language that we use to describe one another in the cut and thrust of political exchange. What a witness. Behold the church, see how they savage one another, just like Colmes and O’Reilly. Why church, if this is what we have to offer? Because they are evangelicals both Slaughter and Gutenson find themselves talking about only half of the hijacking, giving only passing attention (as far as I can see) to the hijacking that is going on, left as well as right, across the church. But given the dimensions of the effort, I think that they can be given a bye on that score. And the book makes it clear that there are offenders on every side of the debate. First: Is “hijacking” really the right metaphor? Hijacking suggests the forcible seizure of something by a third party and that certainly has its application here. Politicians frequently make cynical use of religion as a means of ingratiating themselves to voters. 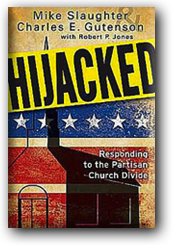 You can also argue that political language has hijacked the church’s ability to speak theologically — or, as the authors put it, partisan politics. But is it as simple as that? I’ve followed the way we use political language as a church and it seems to me that is less often a forcible seizure by politicians and politics, and more often a willful sell out by church goers themselves. 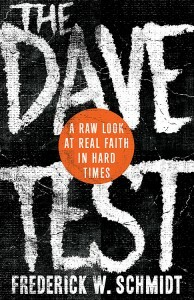 To be sure, there are some who simply lose track of the theological priorities in the middle as they try to “engage the world.” But a lot more of the language used reflects a gleeful romp through the political weeds — scoring points, judging others, and indulging in the stereotypes and language of political punditry. This last set of behaviors is the part that smells like a sell out to me. And having witnessed it first hand, you would be hard pressed to convince me otherwise. This is a deeply seductive game. And once you’ve had a taste of it, it’s like crack cocaine. It’s really hard to put it down and, yes, you’d be willing to sell the Lord’s mother in the name of getting another fix. Playing politics leaves you feeling relevant. (The media even mistake it for real news.) It fosters a sense of intimacy. Once you’ve picked a side, life is simple. If you are ordained you no longer need to face those deeply disconcerting questions about your identity — you are just the guy or gal with the really deep reasons for why we should vote for this or that. You get to play with sharp toys and dirty words. There is no awkward business of explaining why life as a disciple of Jesus is not as simple as registering Democratic or Republican. Nor do you need to deal with the demands of the Gospel on your life that linger long after you’ve been in the voting booth. Second: Is it enough to offer strategies for civil conversation tempered by Christian charity and tools for escaping the ideological bubble? I have no doubt that Slaughter and Gutenson are right to offer this and I can’t but wish them success in their efforts. But it strikes me that their solution illustrates just how hard it is to achieve escape velocity from the gravitational pull of political language. In particular, I found myself asking, “Where is the ecclesiology in all of this?” That is: “Who are the people of God and how do the people of God engage with the world without being co-opted by it?” Where are the tensions? The challenges? The places where, no matter how much we might love our country, we declare ourselves the citizens of another world? Or to, put it another way, how do you escape the ideological bubble and do you need to, when you live in a different bubble to begin with? 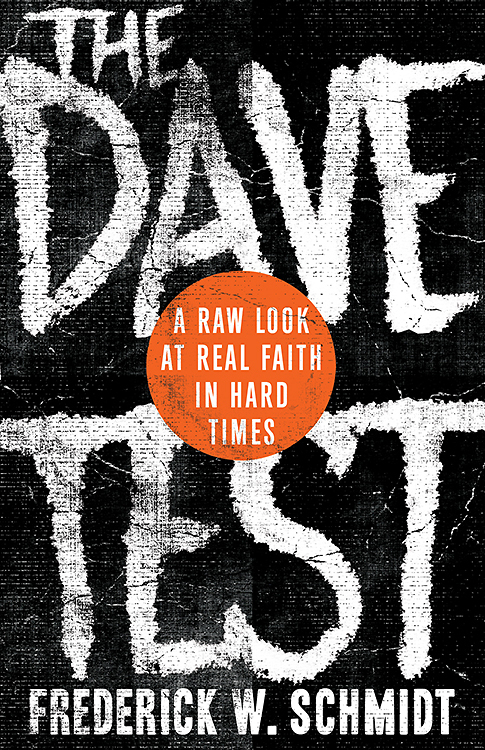 There are a number of interesting case studies that could illuminate this conversation and those case studies would also underline the complexity of living a grounded Christian life in our over-politicized environment. There is William Wilberforce, for example, or Dietrich Bonhoeffer, or Mother Theresa. Each struggled deeply with what might be called social issues. Each took a somewhat different path shaped by the socio-political environment in which they lived. Each engaged those worlds in very different ways and had a different range of options open to them. Each had slightly different understandings of the church. Each had a different level and kind of engagement with the politics of their day. And each spent their life’s blood in responding to the call of God on their lives. I am not a fan of quietist or separatist theologies and I believe that we are obliged to bring the Gospel to bear on the whole of our lives. But a serious conversation about these saints and martyrs (as well as others) could teach us a lot about what it means to be faithful. More importantly, however, it might also teach us how to be the people of God. There isn’t a thing in the list of strategies or even in the bit of theologizing that Slaughter and Gutenson do that I could not find something to like. But I am not convinced that that it is enough to blast free from the ideological bubble. The whole circus that we call the democratic process could benefit from the kind of humility that realization fosters. This week’s column explores the role of creeds and spiritual practice…. Final Words or Parting Shot? Writing a last will and testament should be, and can be, a spiritual exercise. 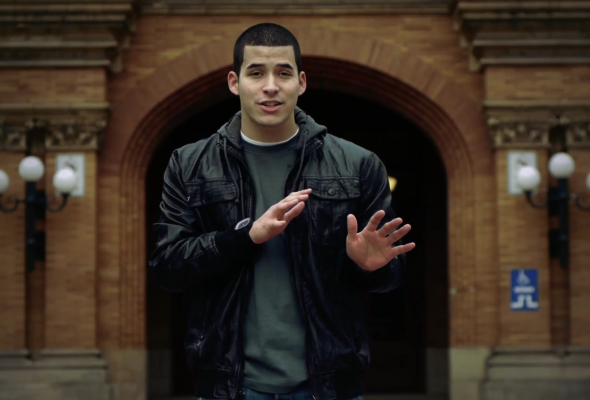 Yet another ill-informed commentator with a camera, a really great leather jacket, and a nice make up job has declared his preference for living down and dirty with the outcasts, choosing Jesus over religion. It’s a great piece and really compelling. There’s not the slightest suggestion in the Gospels that Jesus distinguished between himself and Judaism, or the shape of his spirituality and his commitment to religious practice. In fact, the distinction between spirituality and religion would have been unintelligible to him. What the slick video would have done well to rap on was a distinction made by Gordon Allport over sixty years ago now, but is as old as human behavior itself: the difference between mature and immature religious outlooks. Writing in The Individual and His Religion, Allport points out that three things distinguish someone who is mature in their religious convictions from those who are immature. Arguably Allport’s categories apply imperfectly to Christianity, or to any other religion, for that matter. They are, after all, a modern attempt to identify a phenomenon that has ancient roots that doesn’t yield easily to a one-size-fits-all analysis. But at a minimum, Allport points us to the real problem: It is not religion, but the way in which we appropriate it, that subverts the virtues of the religious life. You can call that failure the product of immature religious sensibilities (as Allport does), you can describe it as immaturity pure and simple, or you can describe it as hypocrisy. But it’s simplistic, misleading, and even a bit immature to describe the problem as the difference between religion and Jesus. 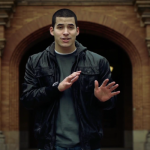 When it surfaces, I don’t like hypocrisy any better than the video’s rapper. I’m an Episcopal priest. I have years’ worth of reasons for wanting to walk out on religion, as does anyone who has ever spent time in the church — any church. But as Karl Rahner points out, “sinners still belong to the church.” To offer the self-righteous criticism that the church fails us masks the fact that we fail Jesus as well. One could argue, of course, as the rapper implies, that he doesn’t compound his failure by trying to be religious. The answer to which is, “No, he makes a video trumpeting the presumption that he is too righteous to be religious.” In other words, he does precisely what we cannot do, because none of us can claim to be without sin. By all means, we should be critical of the church. That kind of criticism, like the criticism that Jesus offered of the Temple leadership in his own day, is a necessary (though not the only) piece of what it means to listen to God. But we cannot be spiritual alone and, to coin a phrase, no one is a self-righteous island. It feels good to visit that place. I’ve always enjoyed trips there. But Allport and Rahner are both right. It’s an immature and spiritually dangerous place to live.